Steel pipes are designed with flexibility and durability. As compared with the pipes made from inert metals, such as copper pipes or aluminium pipes, steel pipes are much stronger. But without special treatment, steel pipes are easy to rust. Once the owners have found that their black steel pipe is not endowed with the protective surface, it is a necessity for them to apply the protective treatment, such as painting the pipes or adding zinc coatings. For domestic owners, paint is achievable without professional assistance. Homeowners may be aware of the need for anti-rust coatings until harsh environment brings out the rust. It is time to make a prompt decision to get rid of pre-existing conditions. Wire wool can be used to handle the rust. Rub the pipes with wire wool by hands and clean the particles with clean cloth. The loose the stubborn rust, the household vinegar or cleanser will help. But remember to clean the liquid left on the pipe surface or they will corrode the steel in the future. A layer of primer needs to be added before applying the final paint. If you have spray gun on site, the task will become much easier. Spray gun helps to ease the painting task and improve the finish quality. If you are not so lucky, the process is a little more complicated since you will have to use the paint brush. The process will last much longer than using spray gun and the work should be done as gentle as possible. Uneven finish will not only undermine the look of the paint, but also disenable the paints to function properly. 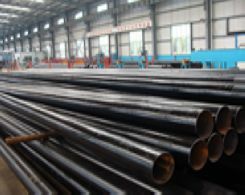 Generally, the black steel pipe purchased from the market is not endowed with paint since it is added with more advanced anti-corrosion surface. The pipes without galvanized surface or other protective treatment are much more affordable. Due to the poor quality, the homeowners can save the expense on price but spend more on maintenance and repair. To be short, the choice depends on the expectations of the clients - Cheaper products mean more expensive maintenance while more expensive pipes intend for cheaper repair. 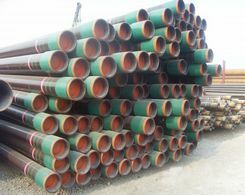 Next:How to Store API Steel Pipe?